2,729 | Deaths from Drug Overdoses – in 2017 there were more deaths from drug overdoses than car accidents in Michigan. 17x | Increase in Overdose Deaths – in Michigan from the span of 1999-2016, from 99 deaths to 1,699 deaths. 11.4M | Prescriptions for Painkillers were written in 2015, equaling about 115 opioid prescriptions per 100 people. 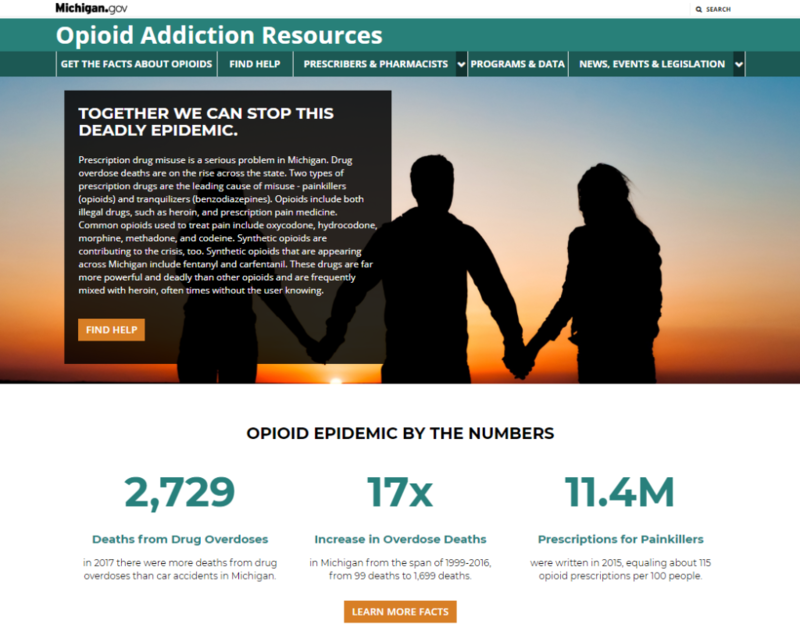 The website is the latest resource offered to Michigan residents by Republican Lt. Gov. Calley in his fight against the #OpioidEpidemic. 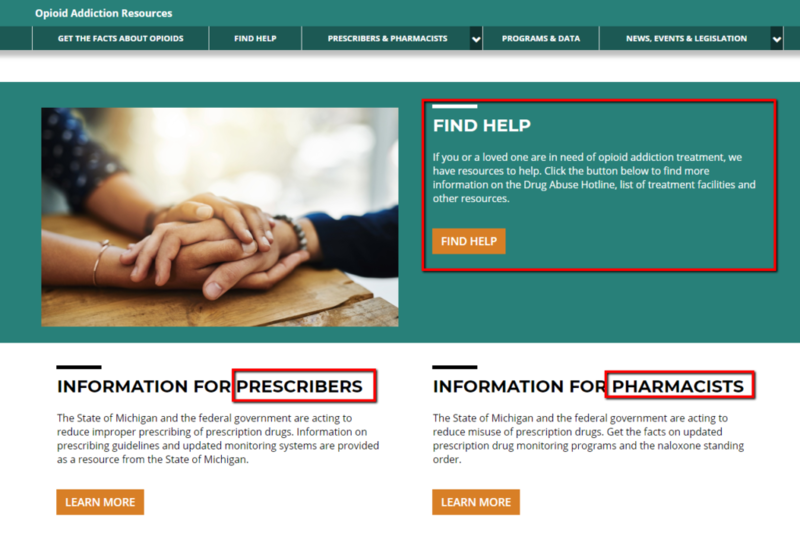 Calley hopes Michigan gov’s opioid website will do more than simply inform people about the epidemic; he hopes it will an active resource for everyone involved in the crisis. Launching the upgraded Michigan Automated Prescription System, which provides real-time prescription data to detect addiction risks, doctor shopping and pill diversion earlier. Organizing details on proper drug disposal of unwanted medications and locations for drop off. Michigan State Police’s Angel Program which helps connect those struggling with addiction with resources for treatment. Setting up a standing order for naloxone, the overdose antidote, at Michigan pharmacies. Website banner on the new opioid website. Who is the opioid website for, exactly? “Regardless of how you’re affected by it, a person who’s addicted all the way through to a person who’s a prescriber that needs information, this’d be a ‘one stop shop’ to help people get the information they need,” said Calley. The website was built to cater to several segments of the website’s target audience. The new opioid website targets several groups of people. A website is a tool, a resource. If built properly, your customized website can do almost anything you want it to. Just as a house is a machine for living in, your website is also a machine. It is a machine built for practical use. As a machine, remember to build your website for a specific reason. A website is a tool to be used; it is more than a brochure of information or a lot of pretty photos. It’s a machine that can be customized to perform any task you want it to. Once you build your website, you need to get visitors to your website. One way to get visitors to your site is to use social media. For example, these posts from twitter include links to the opioid website. Links are one way more people will find out about Michigan.gov’s new website. 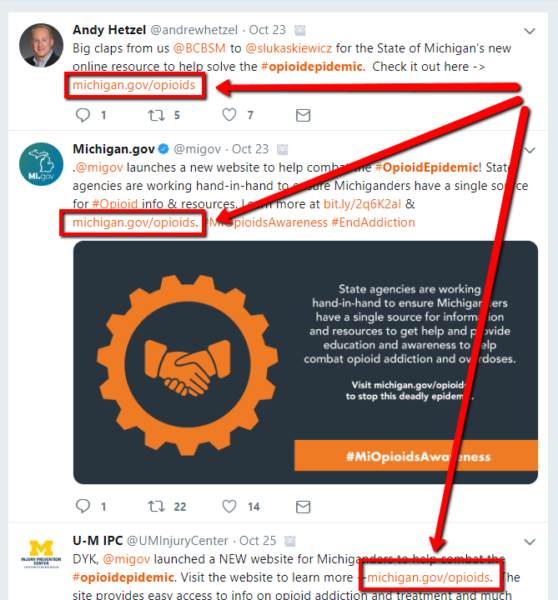 Links in twitter posts help users find the new opioid website. Building links is one of the best ways to get to the top of Google and bring visitors into your website. Not only do more links boost your Google rankings, the links also send visitors straight to your website. You can build links on social media, in online articles and directories – and all of those links will help drive more traffic to your website. If you’re creating a website, it’s important to get all the details right. Need help? That’s why Artonic is here – to support your goals and make your website a success. Each website we build is completely custom. We do not use templates. (Find out why a custom website design matters). Every piece of your website is created specifically for YOU – your goals, your audience, your strategy, and your brand. 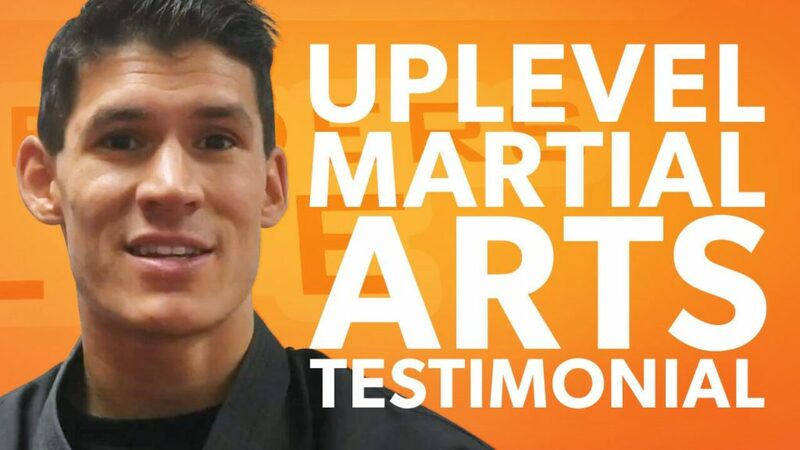 Find out what it’s like to work with an agency to create the website of your dreams: View videos and read case studies about stories from our clients. Give Artonic a call or email us if you’re interested in website design, development, or marketing.